Do you like Boomerang Sports? Share it with your friends. 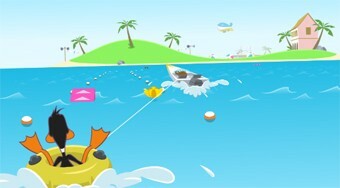 Boomerang Sports is a superbly crafted sports game featuring popular animal characters from animated series. Choose one of the two-member teams - Tom and Jerry, Shaggy and Scooby, Tasmanian devil and duff Duffy and Bugs Bunny with Coyote. Three different sports disciplines await you and your task is to try to get the best result in each.